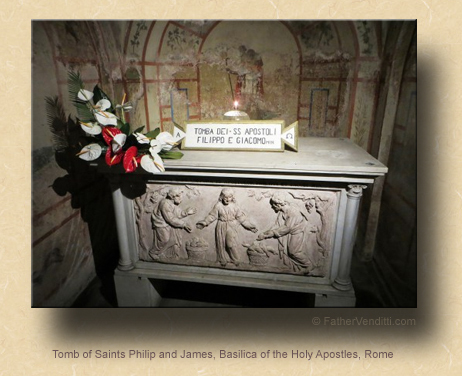 The Feast of Saints Philip and James, Apostles. • I Corinthians 15: 1-8. The Fourth Thursday after Easter; and, the Commemoration of Saints Alexander, Eventius & Theodolus, Martyrs, and Saint Juvenal, Bishop & Confessor. 8:58 AM 5/3/2018 — Among the Galileans who were fortunate enough to be chosen by our Lord to form part of his intimate circle were Philip, the son of Alphaeus, and James, whom we call James the Less because he was younger than the other Apostle James. James the Less was born in Cana, very near Nazareth, and was a relative of Jesus. The Gospel doesn’t record for us the exact moment our Lord met and called him, but we do know that he went on to become Bishop of Jerusalem after Peter had gone to Rome, and wrote the Epistle which Martin Luther rejected because it contradicted his teaching that faith alone justifies without reference to good actions and a holy life. We don’t know the exact circumstances of his death, but it is widely believed that he was beaten or stoned to death for the faith. Philip was a native of Bethsaida, a little town on the shores of Lake Gennesaret, as were also Peter and his brother Andrew, who were probably close friends of Philip. He was martyred by crucifixion. Philip first met our Lord on the banks of the Jordan as our Lord was making His way to Galilee with some of his first disciples. Jesus said, “Follow me” (John 1: 43). That was how Jesus invited people to join his little company: just two small words. Philip did follow, and right away he began introducing his own friends to the One who had become the Center of his life. “And Philip found Nathanael, and told him, ‘We have discovered who it was Moses wrote of in his law, and the prophets too; it is Jesus the son of Joseph, from Nazareth.’ When Nathanael asked him, ‘Can anything that is good come from Nazareth?’…” Philip gave Nathanael the best of all possible replies: “Come and see” (John 1: 45-46 Knox). * In the extraordinary form, on ferias outside privileged seasons, the lessons are taken from the previous Sunday.